As of August 2017, two separate sources have confirmed it: This vintage pair of street signs on Richmond Road and Court Place have vanished, likely into the scrap heap of history. 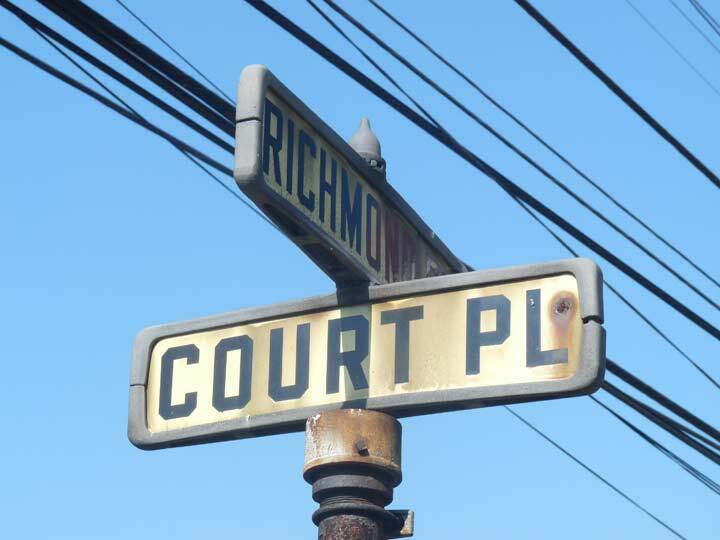 It was one of two pairs of such signs that were no doubt were given a lengthy stay of execution since they were on the campus of the Richmondtown Restoration, which was founded in the 1960s as repository of vintage architecture from all over Staten Island. 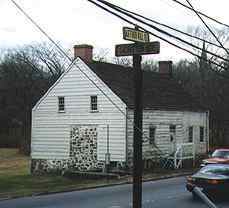 The other pair of such signs that I knew about were on Arthur Kill Road and Center Street (left), also in Richmondtown. When I first started riding buses in Staten Island as a kid in the Swingin’ Sixties, much of the island was still dotted with these perpendicularly-placed street identifiers, which were on their own posts or mounted on telephone poles. They probably had first been installed in the 1940s or 1950s. Their gold and black color scheme would be retained for larger vinyl signs installed in the 1960s, until those as well were replaced with green and white signs in the 1980s. This pair was gone by 2000. 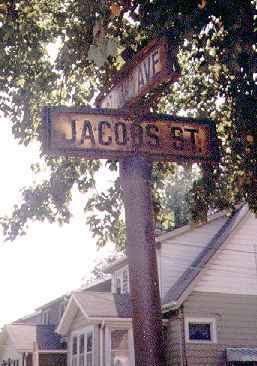 In 1999 I was also tipped about a pair on Jacobs Street in Tottenville, and I duly obtained a photo; the post and its signs were soon removed. In my travels I had also spotted a single Portsmouth Avenue sign on Ocean Terrace in Todt Hill, but I wasn’t carrying a camera then and so didn’t record it. I am aware of a single specimen still surviving in Staten Island. It’s on private property, but near the sidewalk, and I probably shouldn’t broadcast its location at this point. I was at Richmondtown recently ans asked about the signs. The woman tour guide said that they were removed as part of the renovation of the village to look more ‘aesthetic’ to earlier Richmondtown, which includes re-opening many of the shuttered buildings. .